Canine constipation is a common problem in dogs, just as it is in humans. In most cases, the condition can be easily treated at home. If your pet does not respond to home treatments, it is time to visit the vet. If your dog strains strongly during a bowel movement and/or passes hard, small stools, this is considered a sign of canine constipation. Your pet may also strain without producing any stool at all. He may yelp or whine while he tries to eliminate. There may even be blood or mucus in the stool. In more severe cases, the dog may vomit, lack energy and lose his appetite. You may also see your dog's abdomen swell or bloat. These are all symptoms of constipation. There are some simple home remedies that will treat the most common causes of canine constipation. You can add fiber to your dog's diet to ease the bowel movements. Give your dog one to two tablespoons of plain, canned pumpkin a day to increase the amount of fiber in his diet. Make sure that there are no additives, such as salt or sugar, in the pumpkin. You can also give your dog bran to increase fiber in his diet. Two or three tablespoons a day should help relieve his constipation. Just don't give both of these fiber sources on the same day or you could wind up giving too much fiber which can also be problematic. Mineral oil added to your dog's food will help him pass his stool. Give him one tablespoon per every 25 pounds of body weight. Take your dog on regular walks to help the bowels operate efficiently. Give him plenty of opportunities to relieve himself since holding stools too long can cause them to become hard. Your dog should always have access to plenty of clean, fresh water. If you suspect dehydration, you can test your dog's hydration by gently pinching his skin. When you release the skin, it should spring back into place quickly. If it does not, your dog may be seriously dehydrated, and you should see your vet immediately. Certain medications may cause constipation. If your dog is on medication, see your vet for a stool softener to help him eliminate. If your dog is unable to have a bowel movement or if he is vomiting, you should seek medical help immediately for these serious symptoms. You should also see your vet if your dog does not respond to the home treatments. Your dog's canine constipation may be caused by a more serious condition that will need medical intervention. A blockage, for example, may need to be surgically removed. You should also check with your vet if any of the symptoms grow worse or if your dog is in excessive pain. Obstipation is the term for chronic constipation. Some dogs are unable to empty their bowels without help. The colon dilates and fills up with a large amount of very hard stool. 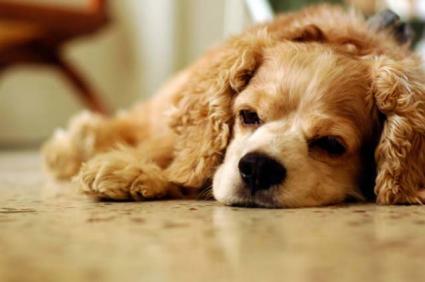 The dog will show the severe symptoms of constipation: vomiting, lethargy and lack of appetite. Your vet will empty the colon with an enema and give fluids to rehydrate your dog. This may be done under general anesthesia in severe cases. A second cleansing may be necessary to ensure that the colon has been completely emptied. A few simple steps can help prevent canine constipation. Feed your dog a high quality diet. Do not give your dog table scraps. Train your dog not swallow rocks, gravel or toys. If your dog licks excessively, find and treat the underlying cause of the licking. This will prevent the formation of a hairball. Make sure your dog has regular exercise and plenty of opportunities to eliminate. Canine constipation can be successfully treated, either at home or with prompt medical treatment. You can also help your pet by preventing the condition before it happens.